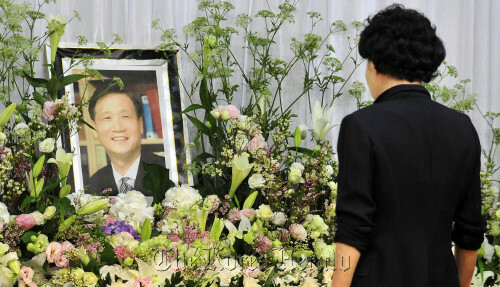 One of Korea’s most influential Christian leaders died at Severance Hospital in Seoul on Tuesday morning. Onnuri Church founder Rev. Ha Yong-jo was 65. Ha collapsed on Monday due to a cerebral hemorrhaging and underwent surgery but did not regain consciousness. Born in 1946 in Jinnampo, South Pyeongan Province, now in North Korea, Ha graduated from Konkuk University and Presbyterian College and Theological Seminary in Seoul. He founded Onnuri Church with 12 families in Yongsan in central Seoul and the church has grown to become one of the largest in Korea. It has nine branch churches across the nation, four prayer buildings and 25 “vision churches.” Its membership recently reached 75,000. Ha also focused on overseas missionary work, sending more than 1,200 missionaries all over the world. In 1994, Ha announced his vision “2,000/10,000” to send 2,000 missionaries overseas and nurture 10,000 lay Christian leaders by 2010. Ha is also known for introducing the concept of “culture missionary,” where Korean entertainers do missionary work overseas. The pastor also pioneered the local Christian publication industry by setting up Christian publication company Duranno in 1980, five years before founding the church. The monthly Christian publication “Living Life” has become a popular aid to meditation for Christians in Korea. Ha underwent surgery seven times during a battle with liver cancer but delivered a sermon at Onnuri Church just one day before he collapsed on Monday. He had also served as vice president of the Korean Association of Independent Churches and Missions and president of Torch Trinity Graduate School of Theology.